Trekking to Paris in February 2015? This post is for you. I’ve got three tips up my zigzag sweater sleeve. So grab a pencil and the Dubonnet, while I crank up the ice machine and Érik Satie. Now, Voyager! It’s high time to sail thou forth, to squeak and shine. Got passion for fashion? Cuckoo for a steal? I hear you, loud and sincere, my moon glow. The “Soldes d’hiver 2015” (big winter sales) launched on Wednesday, January 7, and will continue through Tuesday, February 10. Repeating myself: Prices start to drop and keep on dropping, so it’s a judgment call whether to pounce early and get the best selection, or wait it out a little and get the best deals. Again, to be perfectly honest, I do both. Also, avoid the masses at the grand magasins by shopping during the weekday mornings. However, if browsing cheek by jowl with the Longchamp-toting crowd is your scene, well then, go with the flow. Giddy-up, I say! Gather ’round and jump on my train because I’ve got the cure, see. Prior to your shopping jaunt, I highly recommend spending some time with the late, great Sonia Delaunay, the undisputed queen of Orphism. Curated by Anne Montfort and Cécile Godefroy, “Sonia Delaunay: Les Couleurs de l’Abstraction” will run though February 22, 2015 at the Musée d’Art Moderne de la Ville de Paris. Dear mod squad of Downton Abbey flapper-wannabes: The well-rounded retrospective features 400 works: paintings, posters, prints, murals, rugs, and furniture, along with photographs, fashion show clips, fabric swatches and bolts of printed cloth, too. 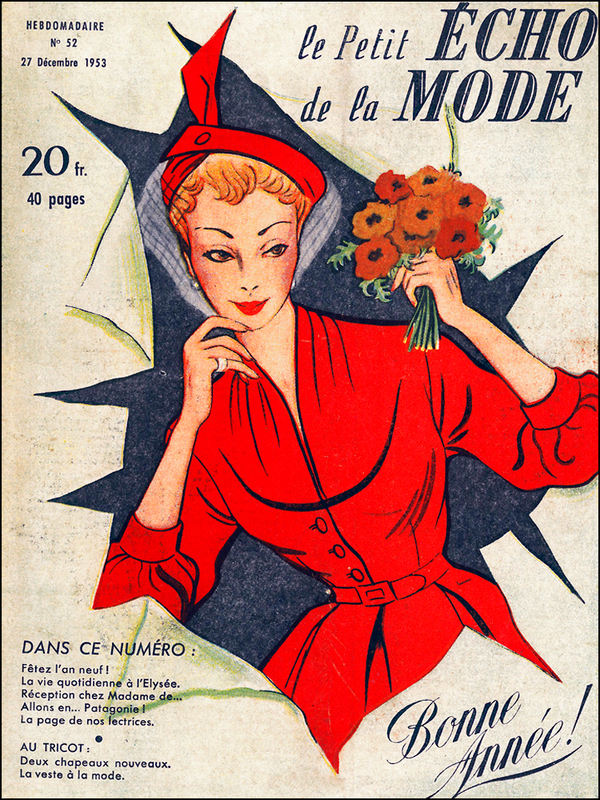 Here you’ll also find Sonia’s Atelier Simultané confections: frocks, beachwear, pajamas, scarves, hats, and shoes. 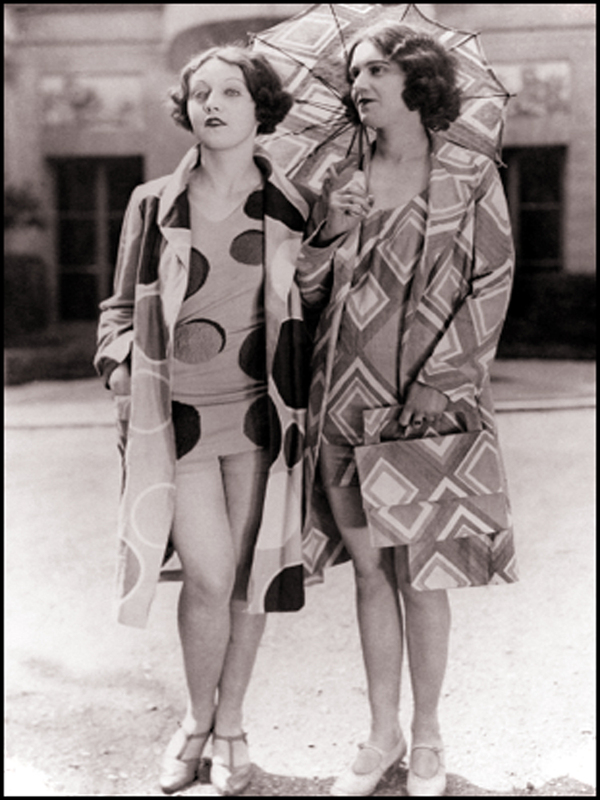 Keep your eyes peeled for the coat she created for Gloria Swanson in 1924. It’s still close-up worthy, Monsieur DeMille! I have seen the glory. Sonia also designed costumes for Serge Diaghilev’s Ballets Russes and for Tristan Tzara. Like a jazz musician, our Lady Dada improvised with color fragments, creating trippy rhythm and movement. With keen Kaleidoscope-like vision, again and again she captured the surreal, heady sensation of experiencing the high rise of planes, trains, and automobiles, along with the electric bright lights in her ch-changing big city. Come forth! Come forth! After traveling back to the Cubo-Future with Sonia Delaunay, I suggest hotfooting it on over to The Big Wheel at Place de la Concorde. 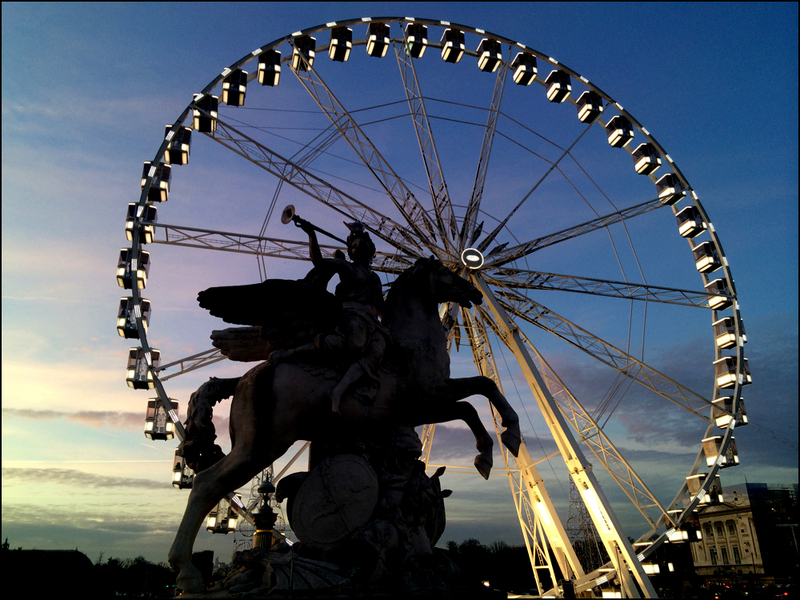 Recently, whilst stepping out down the Champs Élysée, I spotted La Grande Roue, calling out to me like a siren. Facing my fear of heights, right then and there on the cobblestoned spot I decided to take a spin. Time was on my side. At precisely one hair before l’heure bleue, I channeled my inner-Jules Verne, and made the leap aboard the swaying chariot. It was worth every centime. Riding solo, my little eye spotted the Eiffel Tower, the Grand Palais, and Les Invalides, along with Sacré Coeur, the Église Saint-Augustin de Paris, and Catherine de’ Medici’s Tuileries—all bathed in a saturated golden hue. Feeling very much like a queen in my cat-bird seat, I even stood-up, briefly, for an existential “selfie.” Yes, I proved, I was still there! It was scary, but royally fun—I assure you. Tears of joy reigned. 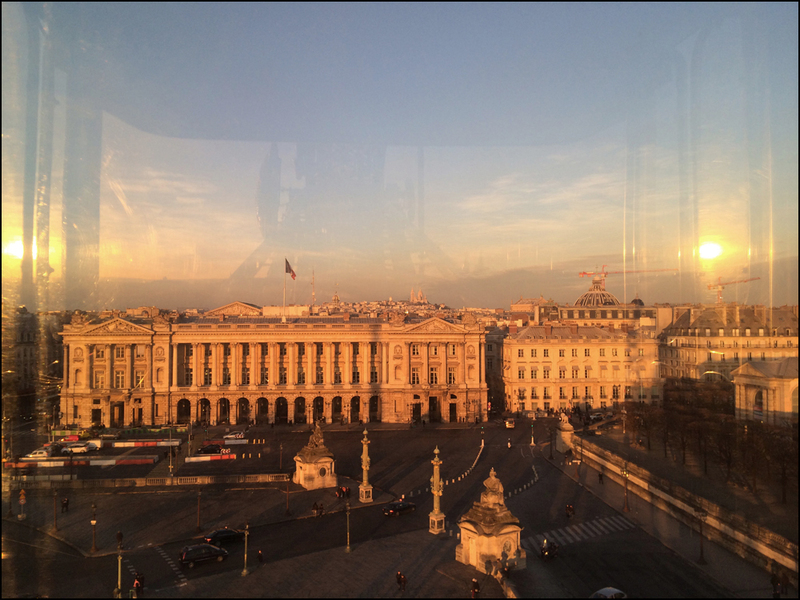 Through the smudged, rose-colored glass, I fell in love with Paris all over again. Heck, I even reclaimed my mojo. Now let’s take a few spins around La Grande Roue, shall we? Carpe Diem! Et Bonne Année! 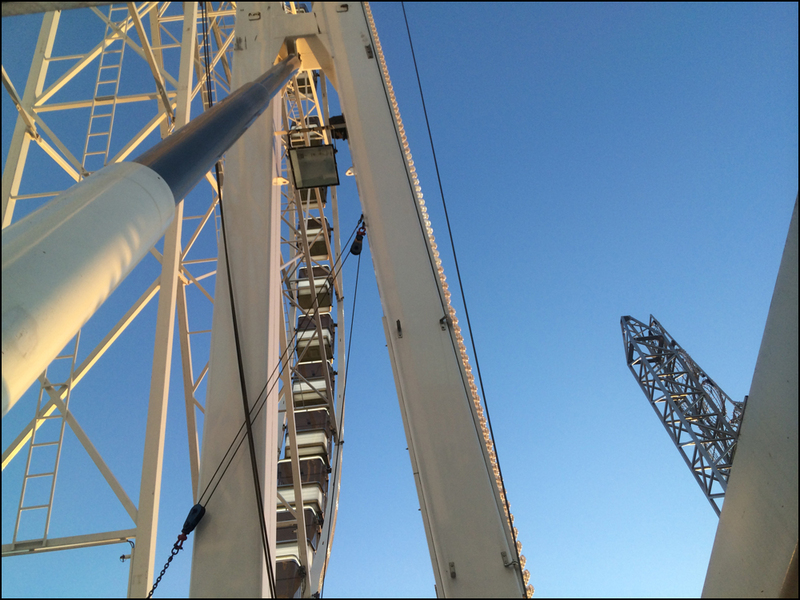 La Grande Roue spins until February 15, 2015. Trekking to Paris? Don’t miss it. YES. 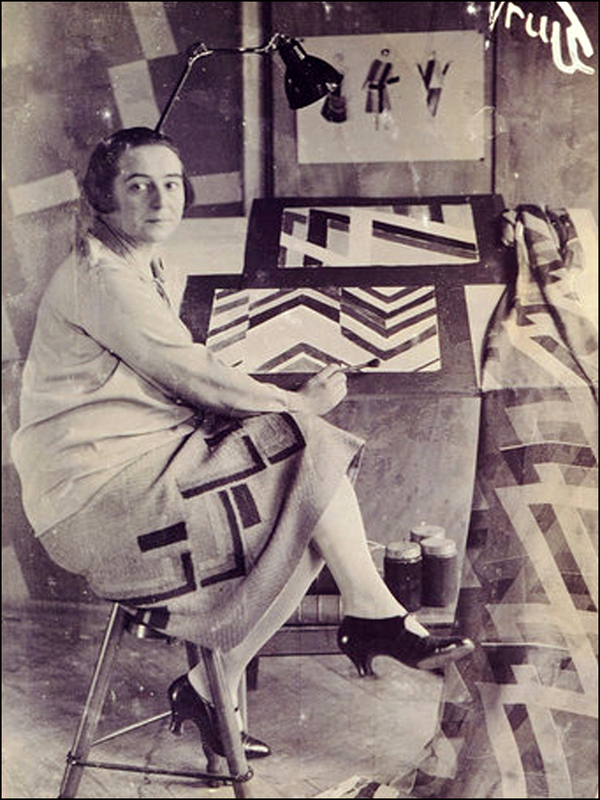 Sonia Delaunay was the queen of the Zigzag! She was also the first living female artist to get a retrospective at the Louvre. 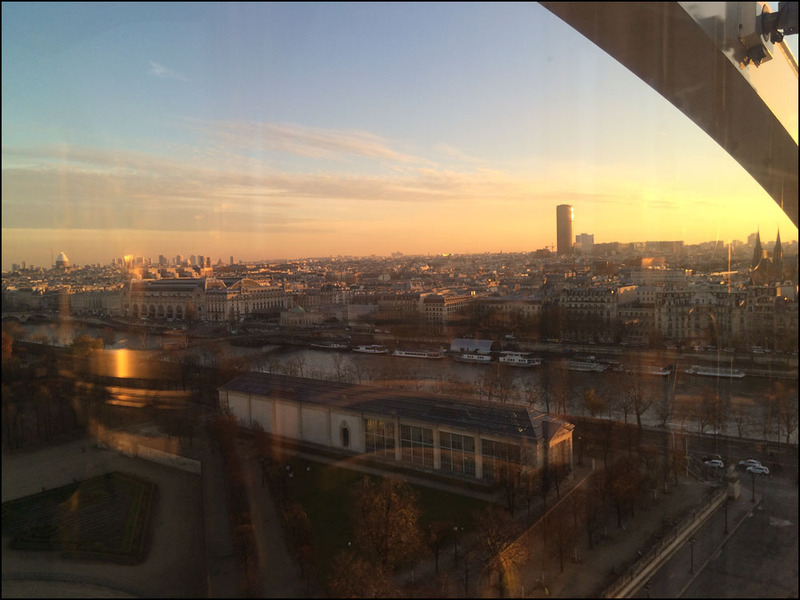 Feb in Paris—sigh, I only wish…. That’s what SHE said! She being Gloria Swanson. According to Stephen Michael Shearer’s book “Gloria Swanson: The Ultimate Star,” the Marquise also spent $25,000 on furs. However, she only spent $5,000 on bags. As a pocketbook fanatic, I’m shocked! 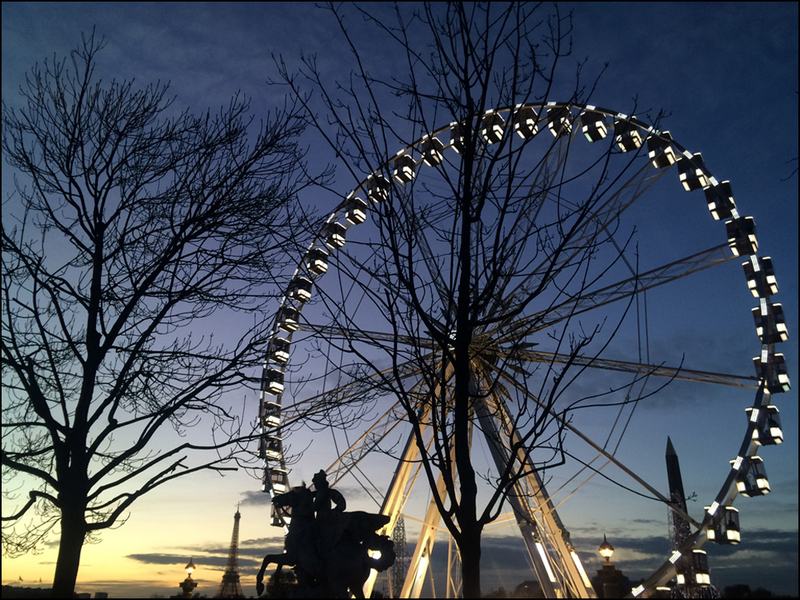 Artistic photos of La Grande Roue. Well, thank you! 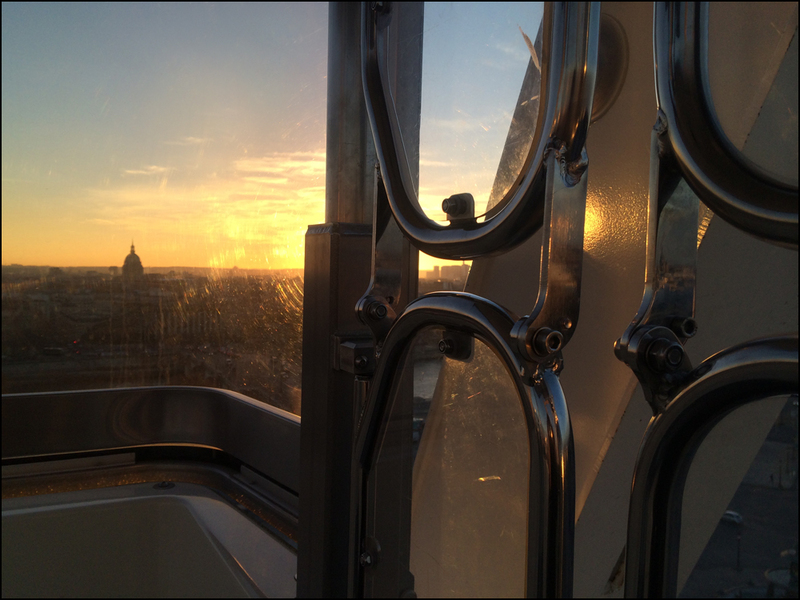 The sunset spin in my little private catbird seat was totally worth the fee. It was scary at times, I will admit. Especially when the big wheel temporarily stopped while I was at the tiptop. Ah, but the view was a “wonderful, wonderful, wonderful” (as Henry Miller would say). Epic blog post Theadora! Wonderful combination of old photos and new with vintage posters. Amazing. First, Theadora I’m so sorry for all your city is going through. I lived through 911 and know there’s nothing I can say that hasn’t been said. I love this post. It makes you forget! I wish I could come to Paris now and just shop! 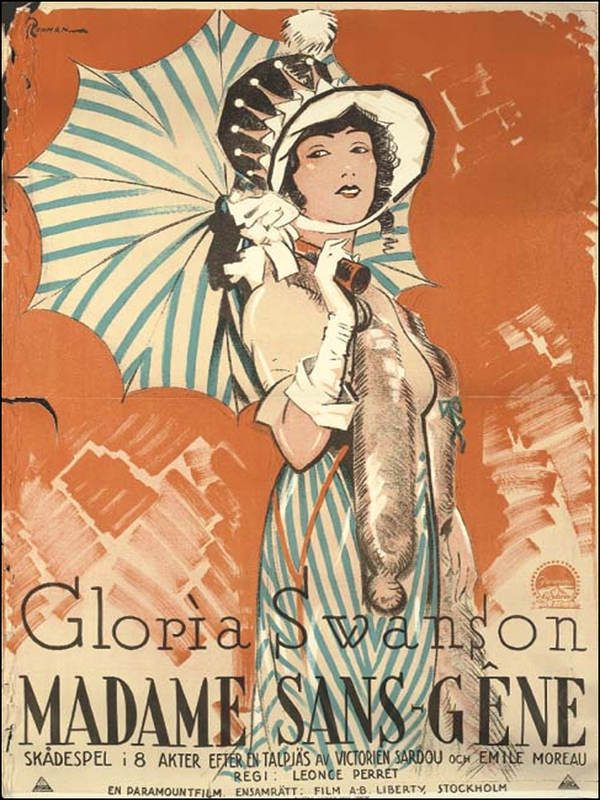 Interesting about Gloria Swanson. I only think of her as Norma Desmond. 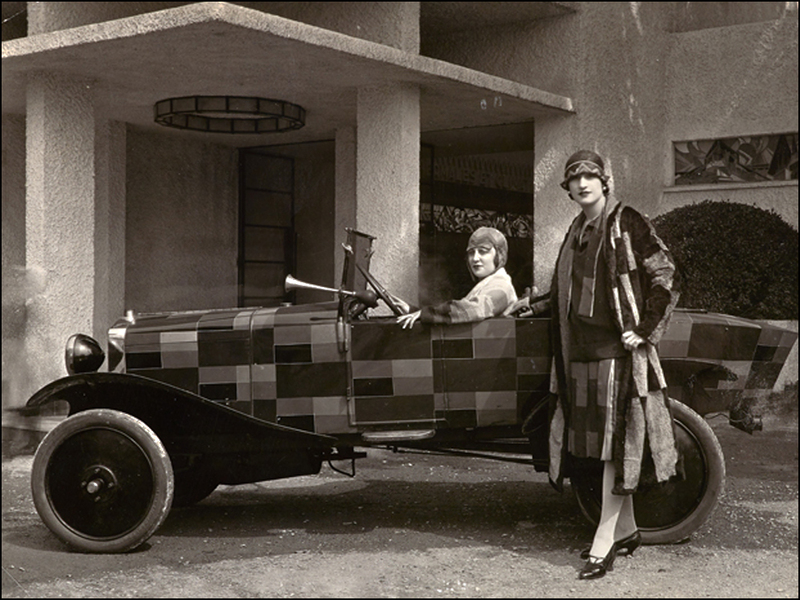 I’ll have to read more about her and also Sonia Delaunay — love her patterns — especially the matching car and dress. Looking at the photo makes me wish I could travel back in time. YES. Gloria Swanson has always been a beauty. Sadly, the 1924 Photoplay report does not include her shoe budget. However, Sonia’s shoes made a cameo at the MAM exhibition. Gorgeous. In black, green, blue, and beige. Little stunners! I also dig the matching car and dress. According to my research, the car is a Citroën Type B12. It had just been launched at the 1925 Paris Motor Show. Checkout Sonia’s driving hats. They were also on display at MAM. Oh, I’d love to have one or three—along with a patchwork coat. What a fabulous event, Kim! Thanks for giving us the link. Are you attending? Have your found or created your Belle Epoch- or 1920s flapper-inspired ensemble? If so, I’m already looking forward to your report and photographs. 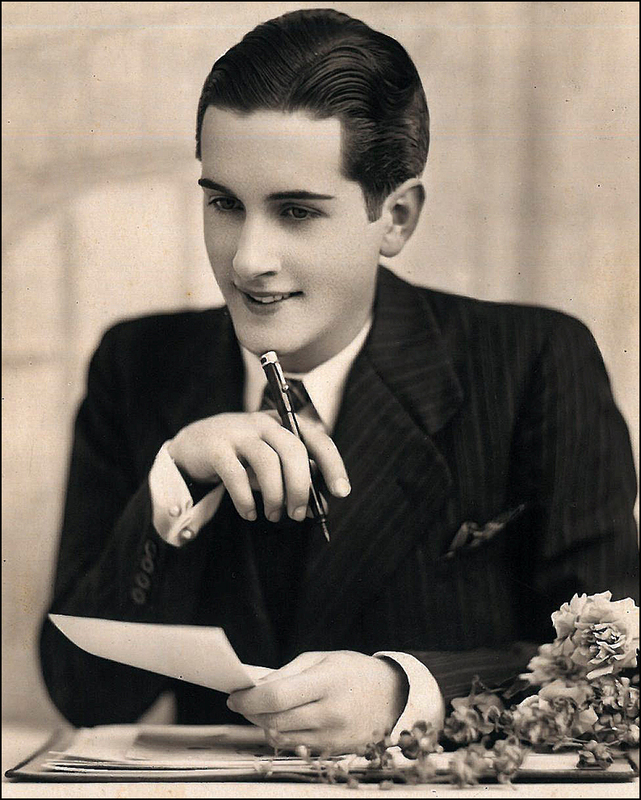 Yes, working on outfits for both eras – I am the host of the events for Le Bal des Coutisans, as president of this association. Bon dimanche! 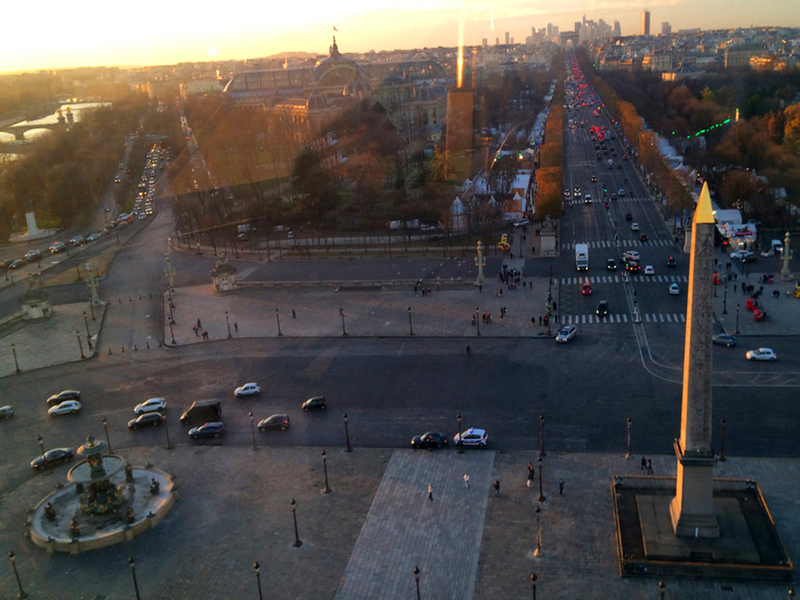 What a fun packed itinerary with super photos over Paris. Well, thank you! During my research, I found a fabulous photograph of Sonia and her cat. Perhaps I’ll dig it up again, and attach it to the end of the post. You’d love it. YES. 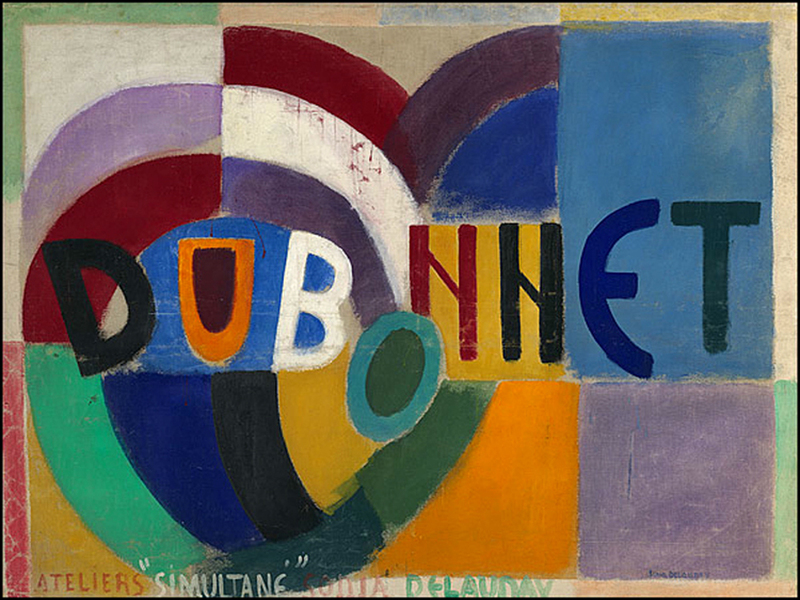 “Sonia Delaunay: Les Couleurs de l’Abstraction” will be at the Tate Modern in London from April 15 through August 9 2015. Exciting! Ha! Again, thanks for your sweet words. And where is our existential selfie ? It’s there. It’s subtle. It’s smashing! Still looks like fun- reminds me of the one I saw in Budapest in 2013. You are the great Guide! Every single post is a lovely journey. And pictures. Pictures are awesome! They leave a sense of physical presence in Paris. Ah, such lovely words, Alexander! Yes! It was a fun post to create: the research, along with the spins around La Grande Roue. The glass was quite dirty, so I tried without luck to get a few shots in between the panels. I highly recommend the voyage. 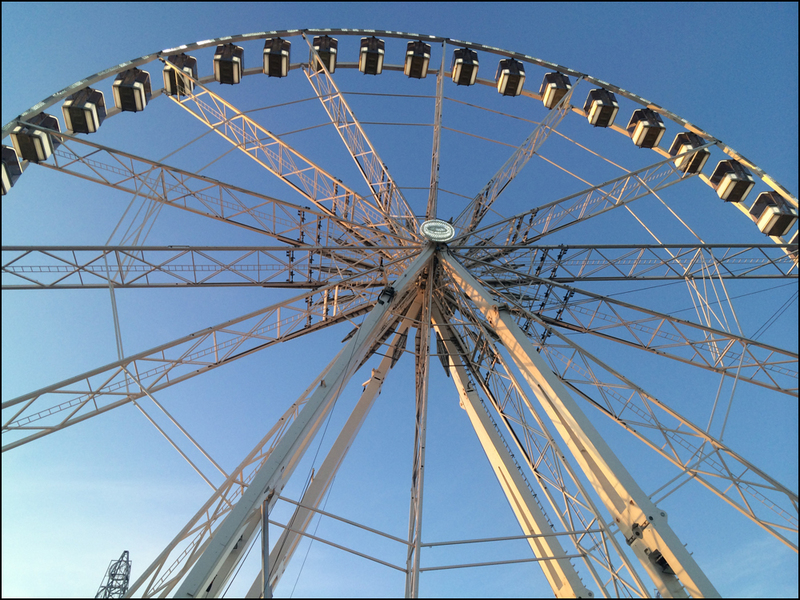 Are you a fan of Ferris Wheels? I also love the Riesenrad in Vienna, featured in Carol Reed’s film “The Third Man” with Orson Welles and Joseph Cotten. While up in Grande Roue, I was pining for some zither music! Thank you, Theadora! Happy New Year to you too. Photography is not only about quality of pictures. First of all it is about photographer’s vision of surrounding World. That is what I like in your pictures. 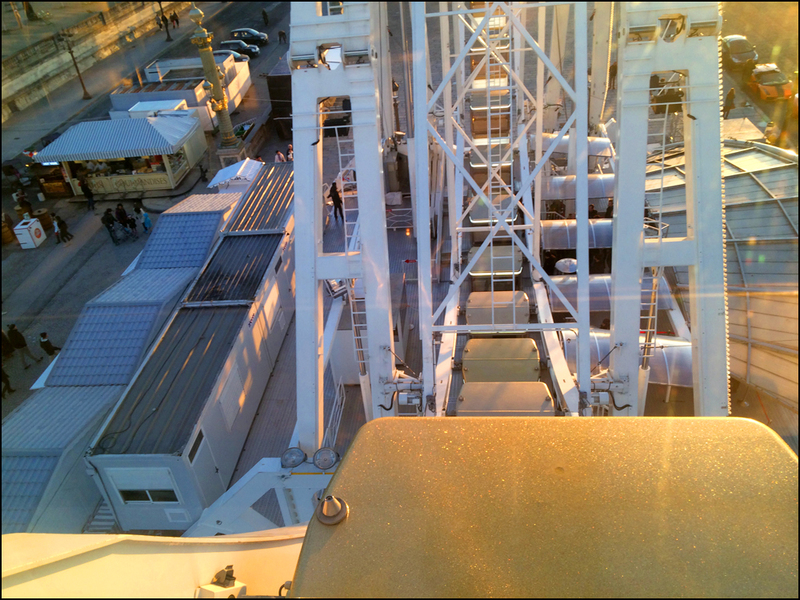 I like Ferris Wheels and any time I have an opportunity to see the World from the above I do it. And I like your thinking, Alexander! Again, thanks for your kind words. Photographie somptueuse, chère Theadora: avec mes meilleurs voeux d’inspiration et prospérité pour 2015! Merci, Sir! I’ve missed your prose. It’s true. Well, thanks for your FANTASTIC words, Janet! I agree. We all should live in living color or in dramatic black and white (perfect for shindigs and dinner parties)! Your photos are stunning! 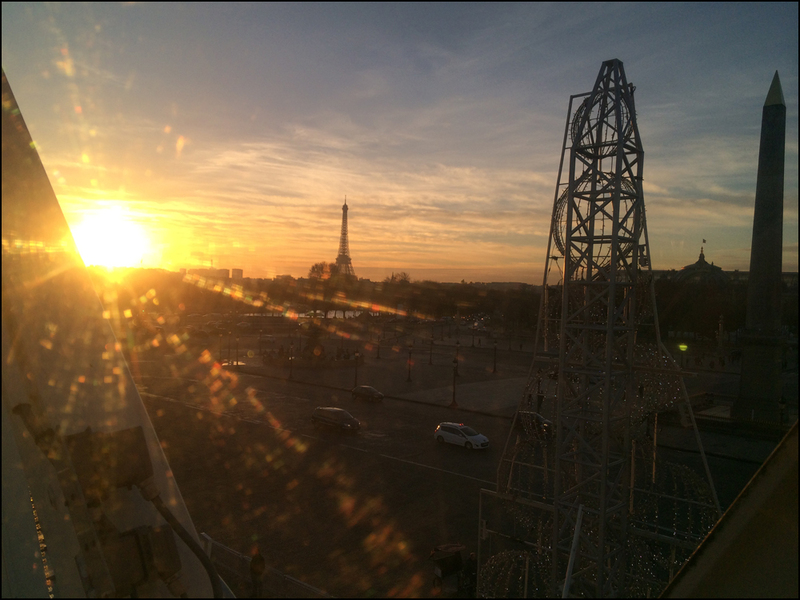 You chose a beautiful time of day to capture the “City of Light.” I love Ferris Wheels and seem to forget my fear of heights through the fabulous views. As always, thanks Anny! Do you have a favorite Ferris Wheel in the world? Merci, Mélanie! I agree. 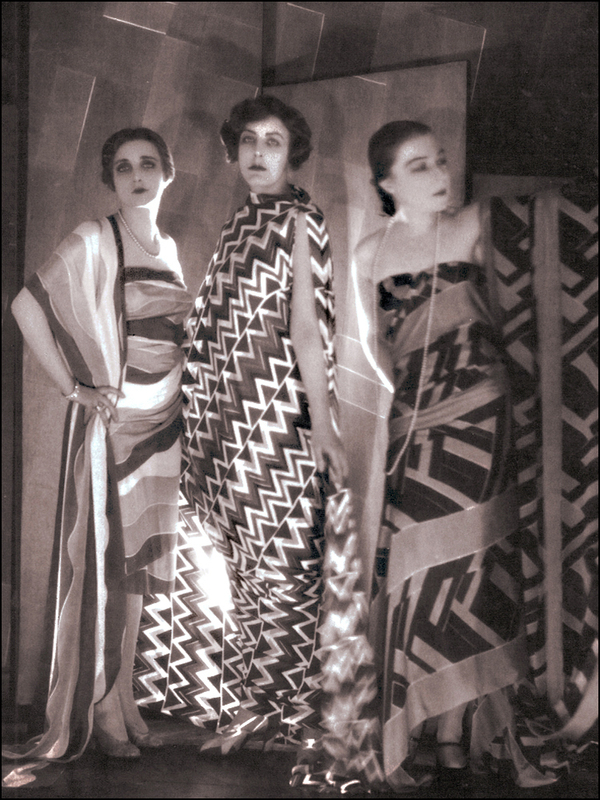 You can’t go wrong with a post featuring Sonia Delaunay and Gloria Swanson. Superb as ever 🙂 bonne année, theadora! Wonderful post as always, T! I heart Sonia! Yes, I’m sure. I love her paintings also. Happy New Year to you too! She reached deep into the armoire cupboard and began to pull our her Longchamp bags Elegant brown, leather trimmed cases. Each bag a little larger than the one before. Like babushka dolls they fitted one into the other. The smallest held the necessities – a silver compact, Chanel lipstick and eye make-up and Theadora’ shopping itinerary. The rest would travel empty. She was returning to Paris. To walk proudly, fearlessly the silver streets. Fill her eyes with the ecstasy that is Paris. Fill her soul with the courage and strength that is Paris. Lastly she would fill her Longchamp bags with the plunders of Paris. Slipping into her ruby red travel slippers she tucked the key to her “little house in Paris” into her purse. CARPE DIEM – Et Bonne Annee! And she was gone. Bonne Année, Virginia! Oh, I love this passage. Beautiful! Perfect timing. Perfect timing. 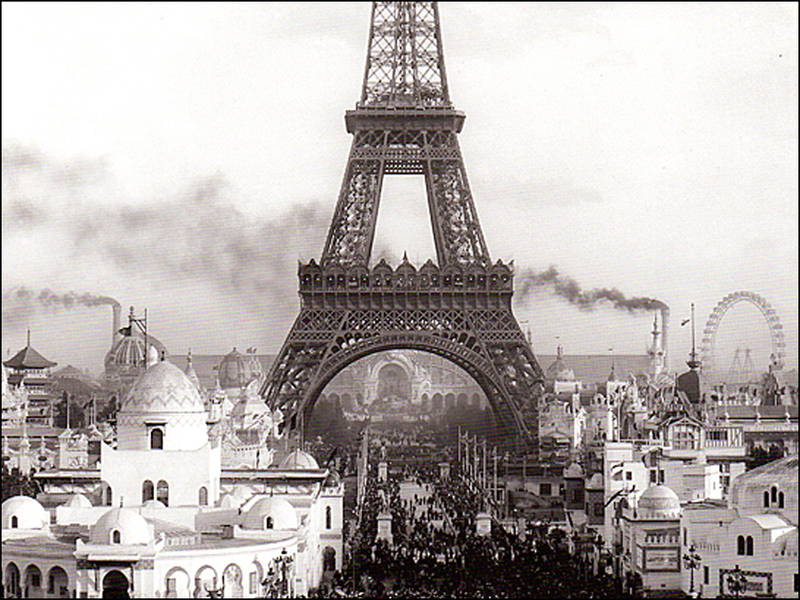 Yes, now is the time to return to Paris, and walk proudly and fearlessly up and down the silver cobblestone rues. Nesting Longchamp bags. Favorite color, please? Brown? How is your little house in Paris? I spotted your dreamy December post. Sorry I’m late to the party but it was worth the wait. Wonderful! I’ve been meaning to check out the Sonia Delaunay exhibition! And your wheel photos are just lovely. 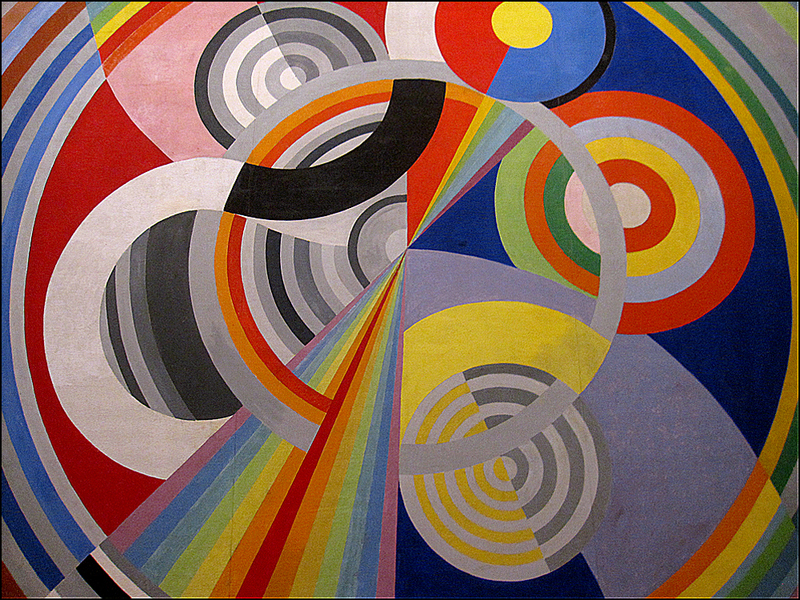 Frances, you will love the Sonia Delaunay exhibition. I’m still seeing zigzags in my sleep. The catalogues are gorgeous and affordable. 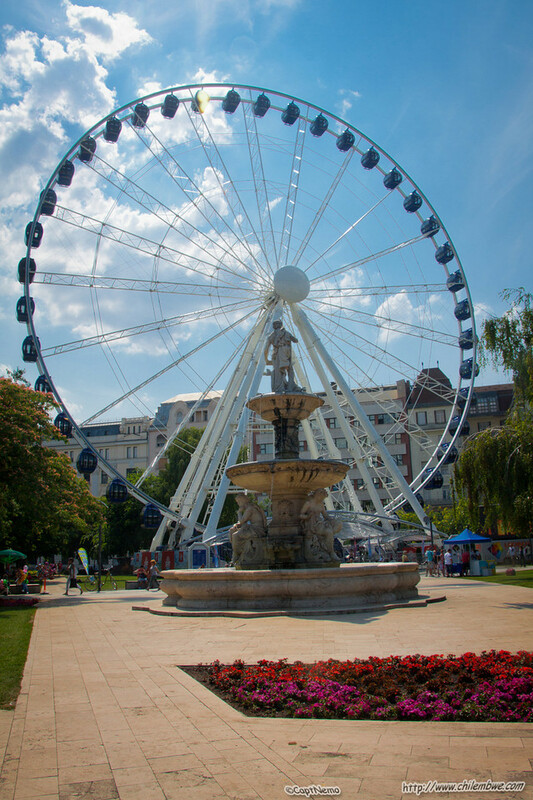 Have you taken a spin around La Grande Roue? 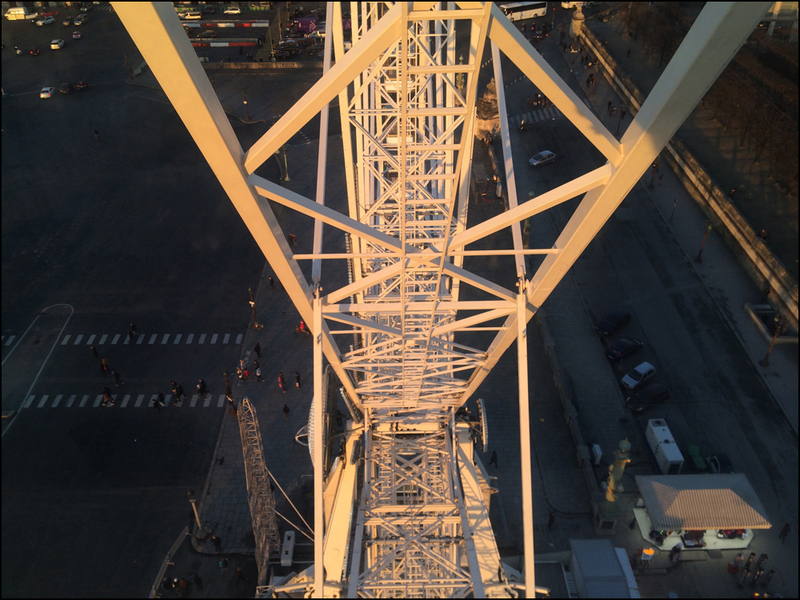 I’d love to see your “Tangerine Drawings” of Paris from the top of the wheel. Oh Theadora– I wish I were there to browse the sales!! And loved, loved the brilliant views from your ferris wheel perch. Fun post!! This was a fabulous feast for the eyes. Thanks again for your insight and depth! Happy New Year about 2 months too late, T. The photo you posted the day of the attacks in your city moved me beyond words…as both of mine [NY, Madrid] have gone through the same, I know. We’ll leave it at that….and a big e-hug. I am absolutely smitten with Sonia! That zig-zag toga is particularly hard to resist…oh the places it could be worn! 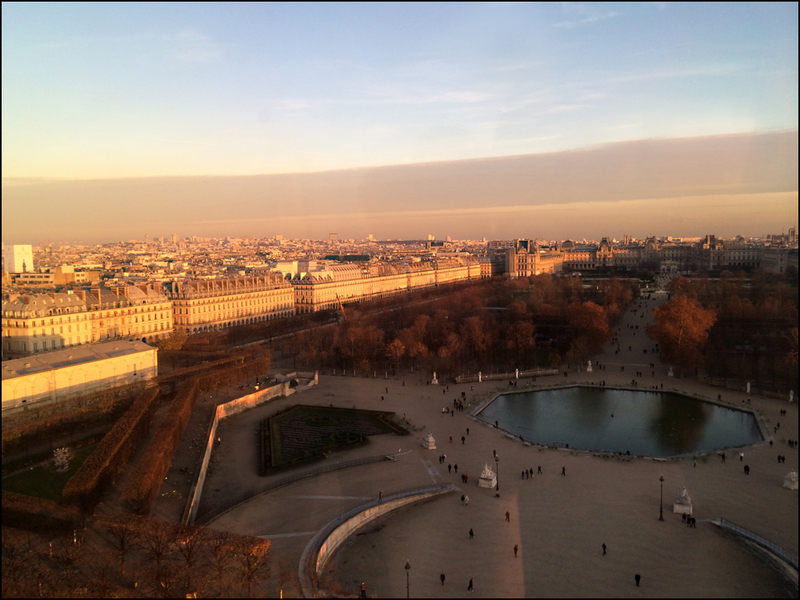 Your bird’s eye snap-shots from la Concorde are a revelation…your website always makes me wish I were in Paris at this very minute. Your advice almost makes me wish I enjoyed shopping…maybe I would in France. I always love your site, ilke a brief Holiday! Fun place to visit! Keep it up!